Cimco has re-commenced production of its 200hp OXE unit today. The re-launch of the 200hp has been much awaited. The first unit came through the assembly line this afternoon. The ramp up of the 200 series will be conducted on a controlled basis – similar to that of our launch of the 150hp engine earlier this year. The units will be shipped initially to a select group of customers. Once we have ascertained the quality of the product, the ramp up will then proceed in accordance to our plans with the overall target of 25 units a week (including the 150hp engine) as soon as possible. – I am very pleased with the re-launch of the 200hp OXE today. I must thank the Cimco staff and consultants for the hard work they have put in over the last few months to get our flagship unit back into production. 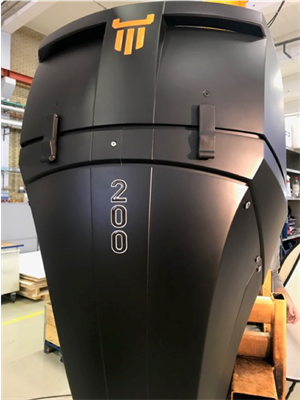 I am very proud that we continue to innovate and work to the highest standards with the main focus of making the OXE a world-class product, says Andreas Blomdahl, CEO of Cimco Marine AB. Cimco Marine AB (publ), is obligated to make this information public pursuant to the EU Market Abuse Regulation. The information was provided by the contacts above, to be submitted for publication on 11 October 2018 at 4.30 PM.